Almost all terrestrial, moist to moderately moist habitats with brushy cover or deep leaf litter, especially bogs and swamps, deciduous and coniferous woodlands, and grassy roadsides and fencerows in agricultural areas. 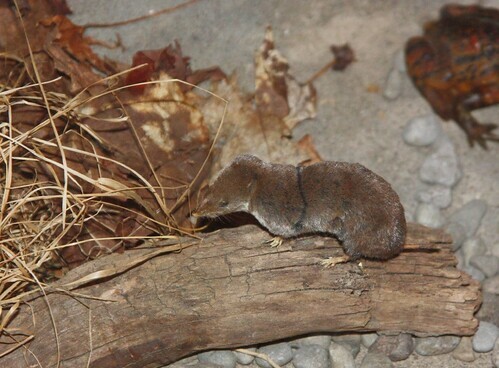 This is the largest and most widespread shrew in eastern North America. It is the most common shrew in Minnesota. Its population fluctuates greatly, at times abundant, up to 12 per acre, at other times in the same area as few as 2 per acre. Adults are 3″ to 4⅛″ in length from nose to tail, 4⅜″to 5½″ in length including the tail. They weigh from ⅝ to 1¼ ounces. Males are slightly larger than females, especially in skull size. The coat (pelage) is dark gray, thick, short, soft, and velvety. It molts in October to November and February to July. The winter coat is slightly darker and may have a brownish cast. The summer coat is almost uniformly dark gray. The belly is lighter gray. Juveniles are paler than adults. The body is stocky. The legs are short. The feet are relatively thick and broad. There are five toes on every foot. The	tail is	short, ⅝″ to 13 ⁄16″ long, about ¼ as long as the head and body together. It is covered with hair. Females have six mammae. Like all shrews, males have one scent gland, up to ½″ long, on each side between the fore and hind legs. On females these glands are less prominent or rudimentary. Unlike other shrews, they also have a scent gland in the groin area. This gland is up to 13 ⁄16″ long and ⅜″ wide and is active in both males and females. The snout is long and sharply pointed. The ears are short and inconspicuous, mostly hidden by the fur. The eyes are tiny and barely apparent. The skull has 32 teeth that are at least in part chestnut-colored. The space between the incisors and molars is less than the width of the widest molar. Canine teeth are present. There are 6 upper and 2 lower incisors. The first upper incisor is greatly enlarged. A pair of glands on each side behind the lower jaw contain a poisonous venom. The venom is released through a duct below the lower incisors and is conducted into prey by way of a groove formed between the two teeth. Giant mole shrew (Blarina brevicauda brevicauda), as the name suggests, is the largest subspecies, 5″ to 5½″in total length including the tail. Manitoba short-tailed shrew (Blarina brevicauda manitobensis) is slightly smaller. The pelage is slightly darker. Northern short-tailed shrew (Blarina brevicauda talpoides) is a medium-sized subspecies, about 45 ⁄16″ long. Sign Shrew tracks are unlikely except in fresh snow. A shrew bounds (hops) like a squirrel. The two front feet land first, next to each other, then the back feet land next to each other and a little ahead of the front feet. The trail is similar to some species of mice but narrower, 1″ to 1¼″ in width. The combination of large size and short tail distinguish this from all other shrew species in Minnesota. Northern short-tailed shrew is a carnivore and invertivore. It eats mostly small vertebrates, including voles, mice, and other shrews; and invertebrates, including snails, earthworms, and beetles. It also eats a variety of plant materials and fungi. It may hoard food, especially snails, at least in winter. It eats up to three times its weight each day in winter, less in summer. In Minnesota, breeding season is from May to August or later. The female will have 2 to 4 litters each year. About 17 to 24 days after mating she gives birth to from 3 to 10, usually 4 to 6, young. The young leave the nest in 18 to 20 days. They reach sexual maturity at 60 days. Most probably die in their first year from predation and cold stress. Those that survive the first year may live up to 2½ years. The northern short-tailed shrew is solitary and territorial. It marks its territory using scent glands and drives intruders away. Its home range varies by availability of prey but averages about 6 acres, overlapping that of its neighbors. It spends most of its time underground. It is active day and night but mostly at night. It is a good burrower and constructs an elaborate tunnel system and nest, usually under a fallen log or stump. The nest is up to 8″ in diameter and is lined with the fur of meadow voles. It will sometimes use the tunnel of another species. The venom allows the shrew to paralyze its prey and eat it at a later time. It is sufficiently strong to kill animals up to the shrew’s size, and to produce a very painful reaction in humans who handle the shrew. Northern short-tailed shrew (Blarina brevicauda talpoides), the eastern subspecies, is the most widespread in North America. It is found only in the northeastern quarter of Minnesota. Giant mole shrew (Blarina brevicauda brevicauda) is found in the remainder of the state. Manitoba short-tailed shrew (Blarina brevicauda manitobensis) is probably found in northwestern Minnesota. 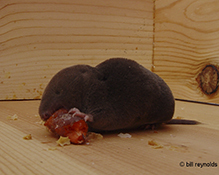 Shrews and moles were formerly included in the order Insectivora, a “waste basket” taxon. Insectivora was shown to have multiple ancestral sources (polyphyletic), and was split into four new orders. Shrews and moles were placed in the new order Soricomorpha. More recent molecular analysis resulted in a reshuffling of the families into just two orders, placing shrews and moles in the order Eulipotyphla. Shrews have a distinctive odor. It has been suggested that this is a defense mechanism against predators but this is controversial. Hawks and owls have poorly developed senses of smell and do not seem to be repelled by the shrew odor. Shrews are also preyed on by snakes, weasels, red fox, and coyotes. Northern short-tailed shrew is the only poisonous mammal on the North American mainland. Cuban solenodon (Solenodon cubanus) and the Haitian solenodon (Solenodon paradoxus) are are also poisonous mammals found on the North America continent, the former in Cuba, the latter in Haiti. Manitoba short-tailed shrew (Blarina brevicauda manitobensis) ? 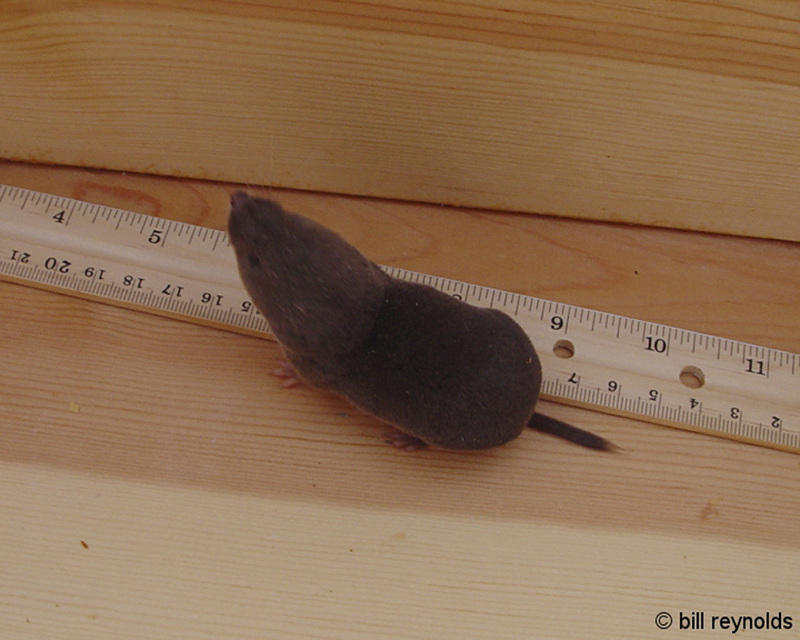 Some authors consider Dismal Swamp short-tailed shrew a separate species, Blarina telmalestes. The "northern short-tailed shrew" is the largest shrew in the genus "Blarina", and occurs in the northeastern region of North America. It is a semifossorial, highly active, and voracious insectivore and is present in a variety of habitats. It is notable in that it is one of the few venomous mammals. The specific epithet, "brevicauda", is a combination of the Latin "brevis" and "cauda", meaning "short tail". "B. brevicauda" is a red-toothed shrew, one of three or four species in the genus "Blarina". It was formerly considered to be a sister subspecies of the southern short-tailed shrew . The species has been divided into 11 subspecies based on morphological characteristics, which are grouped into two semispecies: "B. b. brevicauda" and "B. b. talpoides"; these groupings were mirrored by a molecular systematics study of the mitochondrial cytochrome b sequence. The two groups of subspecies are thought to have been kept isolated from each other by Pleistocene glaciers. 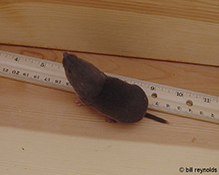 This shrew has a total length of 108 to 140 mm , of which 18 to 32 mm is tail; and weighs 15 to 30 g . The species exhibits slight sexual dimorphism in size, with the male being slightly larger than the female. The dorsal fur is thick and velvety, and can be black, brownish black, or silvery gray, with the ventral fur being a bit lighter and grayer. The shrew molts from a summer coat which is shorter and paler than the winter pelage in October and November, and back again sometime in February through July. The tail is quite short, amounting to less than 25% of the total length. The dental formula is I 3-3/1-1, C 1-1/1-1, P 3-3/1-1, M 3-3/3-3 = 16/16 = 32. Three well-developed scent glands are present, one on each side of the animal and one placed ventrally; the scent may be used for marking territories, though the shrew's sense of smell is thought to be poor. This video uses material/images from https://en.wikipedia.org/wiki/Northern+short-tailed+shrew, which is released under Creative Commons Attribution-Share-Alike License 3.0 http://creativecommons.org/licenses/by-sa/3.0/. This video is licensed under Creative Commons Attribution-Share-Alike License 3.0 http://creativecommons.org/licenses/by-sa/3.0/. To reuse/adapt the content in your own work, you must comply with the license terms. Photographed at the Rydell NWR, Minnesota (21 July 2010). This is the first intact specimen that I've had the opportunity to examine. (I've yet to observe a live specimen.) What surpised me most was (1) the large size of this shrew, and (2) the comparatively large front feet with rather long claws. My first thought was that this was a small Hairytail Mole (Talipdae: Parascalops breweri)! But the range of that eastern species does not extend even as far west as Wisconsin. The Northern Short-tailed shrew (Blarina brevicauda) is the 107th species in my Mammals of the World series. The short-tail shrew is the only North American mammal with a poisonous bite. That's a cool fact, but too bad for an unfortunate snake! Found this little fellow in my seed bins. Moved the shrew into a wooden fore better photo ops. Dang little thing just wouldn't sit still very long and I was have trouble lining up a shot.